Clarks ladies sandals black flat size UK 5 EU 38. only worn for one season so in very good used condition. Insole approx 9cm across at widest point. Insole length approx 25cm. Clark’s Sandals Size 5. Condition is New with box. Dispatched with Hermes Tracked. Ladys Clark's Flip flops Pink Size 5. Condition is New with box. Dispatched with Royal Mail 2nd Class. Hi, these are lovely soft leather sandals from Clark’s. Uk size 5, excellent condition like new worn once for about a hour if that. From the clarks somerset range, inner sole fully cushioned. No marks. Worn, still in good condition. A few minor marks and dirty soles. WORNBUT STILL IN GOOD CONDITION. Clarks Trigenic Black Sandals (UK 5). Condition is Used. Dispatched with Royal Mail 2nd Class. Bought summer '18, hardly worn. I'm usually a 4.5 and find these a little too big on me. This item fits true to size and comes from a smoke-free home. Please contact me to ask any questions. Take a look at my other items, I'm having a clear out! UK bidders only, please. Good luck! 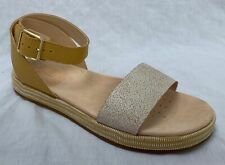 Ladies Wedge Sandals UK Size 5. As good as new. Worn once. Comes with box. Selling as too small for feet. Condition is Used. Dispatched with Royal Mail 2nd Class. CLARKS BEIGE/BROWN (MORE LIKE DARK BEIGE) HIGH HEEL WEDGES ESPADRILLES SANDALS. Leather olive green with cork wedge heel. UK 5 - EUR 38. New never worn. Box not their own, but from similar pair that fits them. 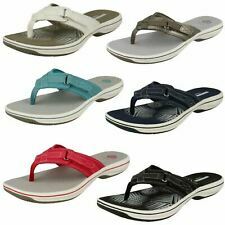 This comfortable leather sandals have a soft bed sole which has pretty flowers details inside it. Clarks Springers size 5/38 new purple . Dispatched with Royal Mail 2nd Class. Black Clarks Jaelyn Fog Sandals in Size 5. Worn a handful of times so very good condition UK Bidders only. Clarks Tri Ariana Black Combi Sandal. Worn twice. In good condition. From smoke free home. 0.5” rubber heel and sole unit with padded aerated insole. Outer sole width at ball of foot is 3.5”. Strappy white leather uppers with hook-and-loop ankle strap and logo to side of ankle. 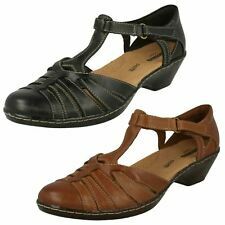 A pair of new without box, Clarks, 'Unstructured' strappy sandals with leather uppers and linings. They have a low heel, velcro fastening and non slip sole for a comfortable fit. SIZE UK 5. IN TAN AND WHITE. IN A HARDLY WORN GOOD CONDITION. They are lovely quality, beautiful quality materials. Black padded footbed. Black rubber trek sole. I will point these out if visible & identify any wear or other marks or blemishes as best as I am able. Unstructured Artisan red leather wedge sandals. Velcro strap across foot, hook & loop velcro ankle strap. 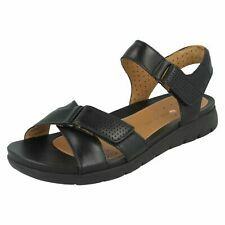 Size 5 Clarks Ladies Black Unstructured Summer Sandals. Condition is Used. Smoke free home. Worn a good few times but plenty of wear in them still. Dispatched with Royal Mail 2nd Class. A LOVELY PAIR OF LADIES CLARKS ACTIVE AIR TURQUOISE BLUE LEATHER WITH JEWEL TRIM T-BAR SANDALS SIZE UK 5 D IN VERY GOOD USED CONDITION AS YOU CAN SEE FROM SOLES & HEELS THEY HAVE HAD VERY LITTLE WEAR. Clarks Sandals. Size 5 (approx. 25cm from heel to toe and 9.5cm across widest part of shoe). Black leather uppers. Comfortable leather lined cushioned footbed. Rubber soles. In excellent condition. Buckle fastening. Clark sandals. zip at back.